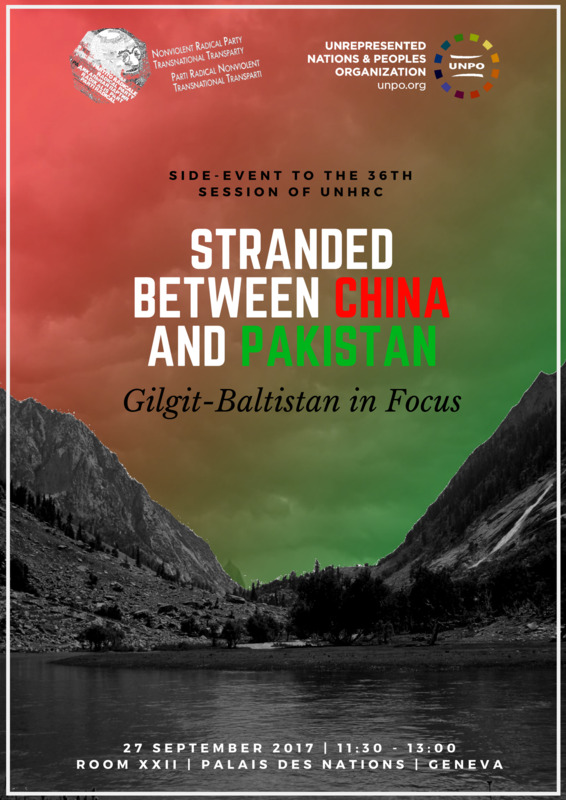 On the occasion of the 36th Regular Session of the United Nations Human Rights Council (HRC), the NonViolent Radical Party in cooperation with the Unrepresented Nations and Peoples Organisation (UNPO) will be organising a side-event entitled “Stranded between China and Pakistan: Gilgit-Baltistan in Focus”. Since 1948 after the UN Resolution 47 had passed with no success, Gilgit-Baltistan has been occupied by Pakistan. The once peaceful region has ever since been suffering from discrimination and violence. Disfranchised from political processes, harassed by outsiders, as well as being targeted by sectarianism; the suffering of the indigenous people of Gilgit-Baltistan has no end. Now, under the implementation of CPEC, new and drastic offenses are coming to light. The infrastructural project is going to affect more than 400.00 people, leaving a large number displaced and their livelihood destroyed. Furthermore, cultural heritage sites are being demolished and outsiders are settling into the community, reducing the people of Gilgit-Baltistan to a minority in their own territory. Besides the fact that the local population has been excluded from decision-making processes, Islamabad has tried to silence activists who oppose the project by unlawfully detaining them on grounds of alleged “sedition” and terrorism. Contrary to the official state narrative, CPEC is not only endangering the lives of the people in the region but is also using their own territory to exploit them. In this context, this side-event will focus on the human rights violations within Gilgit-Baltistan under Pakistani occupation, as well as give an insight into the challenges the local community is facing with the CPEC implementation. High-level speakers will also take the opportunity to raise awareness of the UN resolutions on the matter and call upon the international community to take a stand and let the cries of help no longer be unheard.